Eating dried fruit is associated with lower body weight and consuming a more nutritious diet, according to a study in the June 2011 issue of "Nutrition Research." Dried fruit is recommended as one healthy choice for filling your daily fruit requirement. It delivers more fiber and minerals, and about the same amount of B vitamins, as fresh fruit. Just be aware that a small portion of dried fruit has significantly more calories than fresh fruit. As water evaporates during drying, the fruit shrinks in size and the remaining nutrients become more concentrated. In spite of the size differences, ChooseMyPlate.gov makes it easy to compare dried to fresh fruit because it defines 1/2 cup of dried fruit as equal to 1 cup of fresh fruit. Fruits are often treated before being dried to preserve the natural color and prevent bacterial growth. The treatments may be natural substances, such as lemon juice and vitamin C, or they may consist of sulfur or sulfites. 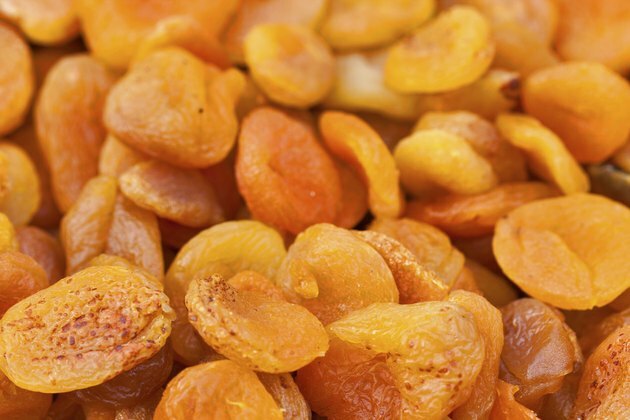 If you have asthma or you're allergic to sulfites, avoid treated dried fruit. Dried fruits contain more calories and carbohydrates than their fresh counterparts. One-half cup of dried apples, apricots and raisins all have double the calories and at least twice the carbs compared with the amount in 1 cup of fresh fruit. The increased calories and carbs are bad news if you're watching your weight. On the other hand, dried fruits can give you a convenient source of energy during endurance activities. Raisins give the same performance boost as commercial sports chews, according to the June 2012 issue of the "Journal of the International Society of Sports Nutrition." Water-soluble vitamins are lost during the drying process, but the loss is counterbalanced as nutrients become more concentrated during dehydration. One-half cup of most types of dried fruit has about the same amount of B vitamins as 1 cup of fresh fruit. However, you'll lose a significant amount of vitamins C and A. Dried fruit retains only 20 percent of the total vitamin C and half of the vitamin A, according to the USDA Agricultural Research Service. A few fruits, such as apricots and cherries, contain so much vitamin A that the dried fruits are still a good source. Dried fruit retains 100 percent of the fresh fruit's minerals, according to the USDA Agricultural Research Service. Together with the increased nutrient concentration, you'll end up getting more minerals from 1/2 cup of most types of dried fruit than 1 cup of fresh fruit. Dried fruits provide iron, potassium, magnesium and zinc. However, each fruit has a different nutritional profile, so the amount you'll get of each mineral varies depending on the type of fruit. The amount of natural sugar in many types of dried fruit doubles just like the calories. Watch out for excess sugar because it's sometimes added during processing. Some dried fruits are coated in sugar. It's also added to sweeten sour fruits such as cranberries. One-half cup of dried, sweetened cranberries has 10 times more sugar than 1 cup of fresh cranberries. ChooseMyPlate.gov: What Fruits Are in the Fruit Group? How Many Calories Are in One Glass of Orange Juice?